N.B. Mangal closed in December 2015. I’ve left the review up for posterity. It feels like eons ago, but back in December Reading was transformed into a winter wonderland. There was an ice rink and a festive funfair in Forbury Gardens. The area down by the Oracle Riverside, occupied by the prehistoric crazy golf course in the summer, became a German-themed bar selling Glühwein and Bavarian beer. The square outside the Town Hall became a festive market, with loads of cute little cabins offering a variety of food, drink, crafts and other goodies. Sounds marvellous, doesn’t it? There was only one catch, which was that nobody was terribly impressed. Most reports of Forbury Gardens (it was opened by camera-shy shrinking violet and brainbox Joey Essex, which with hindsight might have been a sign) were that it wasn’t great: people said that ice rink was decent enough, but that the funfair around it was a grotty way to be parted from a lot of money very quickly, the main concession to the festive season being some makeshift tinsel antlers hastily attached to the horses’ heads. I’m informed that the Glühwein at the “Wundrmarkt” was synthetic tasting, and there wasn’t any outside heating: I always felt a bit cold wandering along the riverside and looking at people huddled at tables trying to have fun. As for the festive market, well, I wandered round it several times with a growing sense of despair mixed with indignation. Many of the food stalls were selling almost exactly the same things – a few did hog roast, a few did mulled wine, the rest were an anonymous smudge of winter kitsch. Worst of all was the horror of “Quidsticks”, a stall offering a variety of meats on a skewer for a pound (including sausages, that food so frequently found on a skewer). If you were visiting the town by train it would have been one of the first stalls you’d clap eyes on: it just looked tacky. The decent stalls – the ones that reflected what Reading was really about, that had a genuine connection with the town – stuck out like a sore thumb. I felt for the Grumpy Goat, on the edge of the market, and for Reading’s brilliant milliner Adrienne Henry. By the end she had stopped bothered opening, and many of the retailers complained to the organiser. Apologies for starting this review with a rant, but the thing that saddens me most about all of it is the idea – prevalent among many people who don’t love Reading the way I do – that we should be grateful for anything we get. I think a lot of people think we should be happy to have a Christmas market at all, even if it looks like Lapland’s answer to Moss Side. They think an ice rink is a great thing, even if it leaves our beautiful Victorian park looking like a war zone afterwards. They don’t go to Bath, or Winchester, and think “why can’t we have a beautiful event like that?”, they think “they deserve that stuff and we don’t”. And if there’s one thing that annoys me it’s that underlying attitude that average is good enough for Reading. We have some great stuff here, we deserve better and we should aim higher. After all, surely nobody looks at the Broad Street Mall and actually says “yes, that really is Reading’s favourite mall”? I’m afraid this train of thought was very much set off by visiting Mangal this week, because it’s another good example of this phenomenon. 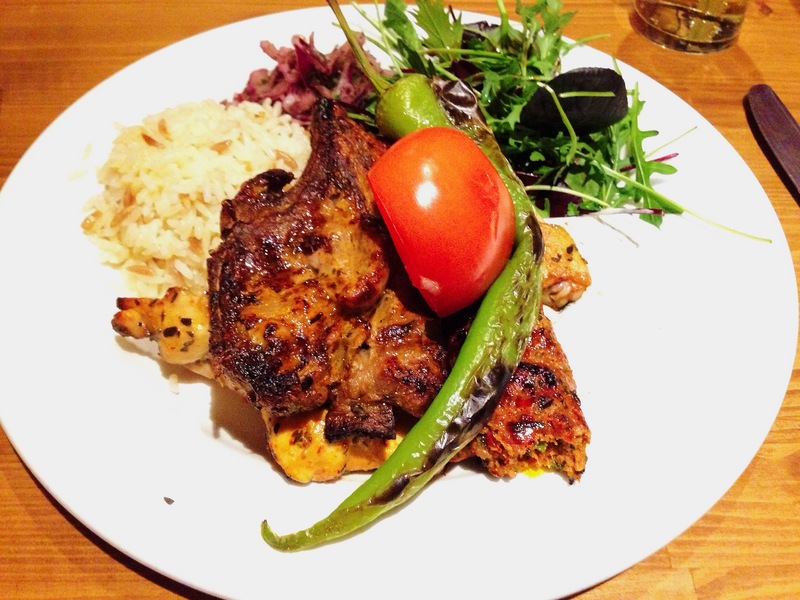 Some people might think “isn’t it great that Reading has a Turkish restaurant?”, whereas I want to be able to say “Reading even has a Turkish restaurant, and it’s brilliant.” But I can’t, I’m afraid, because Mangal isn’t it. It’s not a bad space, on St Mary’s Butts just down from Monroe’s and Coconut. It’s mainly one big room packed with tables and a raised area with smaller tables (which is where they sat me). I can’t help remembering its previous location, where House Of Flavours is now, and thinking that was a much better spot for them – partly because their charcoal grill was out where you could see it, filling the air with those tantalising smells and giving you an idea of what was going to arrive on your plate. Without that the restaurant felt a bit boxy and lifeless (although perhaps the belly dancing – on Friday and Saturday nights – changes all that). The menu is a range of hot and cold meze – no real surprises there – along with mainly grilled meats as main courses. The meze which turned up first were solid and unexceptional: sigara boreki, tubes of filo pastry filled with feta, herbs and egg, was the best of them although still very much the sum of its parts. It conjured up memories of cheese pies on holiday in Greece, which was great, but divorced of those happy thoughts it was nice but unspecial. It did fare better than the houmous though – a fridge-chilly bowl of something which was virtually indistinguishable from a two pound tub of houmous from Sainsburys. I didn’t get any garlic, any smoke or any tahini, and a few little dabs of olive oil and a dusting of paprika were never going to transform it from duckling to swan. Another disappointment: Turkish pitta is a wonderful thing, dimpled, thickier and fluffier than its Greek sibling, but this was over-flattened, crispy and brittle. For mains I quite fancied trying pide, the distinctive boat-shaped Turkish take on pizza, but confusingly although it features on the website menu it was nowhere to be seen on the printed version. Instead I went for the grilled meats, reasoning that this was where Turkish food really excels, but that too was no more than okay. Karisik izgara was a selection of barbecued lamb and chicken, and when it turned up it looked like an embarrassment of riches. But, like the Christmas market or the ice rink, it was mainly veneer. The best thing, the lamb kofta, was quite delicious – beautifully spiced, lovely, soft and tender. But the lamb chop was oddly bland – an awful lot of work to take off the bone, not at all pink and somewhat short on flavour. Most of the chicken was also on the bone – a couple of wings and a couple of what looked like minuscule drumsticks – and I’m not sure it was worth the effort to get it off. The first mouthful of these triggered happy thoughts – that glorious mixture of tender meat, charred skin and the hint of smoke – but the first mouthful was pretty much all there was. Last of all, there were a few chunks of chicken breast; firm rather than tender, with no evidence of any seasoning or marinade. By the time I’d finished this, the pile of bones on the edge of my plate seemed almost as big as the pile of meat that had arrived. The accompaniments – some pleasant enough rice, a puddle of yoghurt and mint with an oddly artificial taste, a rock hard tomato which had apparently once had a skewer through it – added little. The moussaka was similarly disappointing. I like a firm moussaka made up of discernible layers, tall rather than wide, with different textures for each of the layers. Instead this was a large, flat ramekin which definitely had potato, aubergine, meat and sauce in but was so (and I can’t find a more charitable word for this) runny that it wasn’t massively appealing. 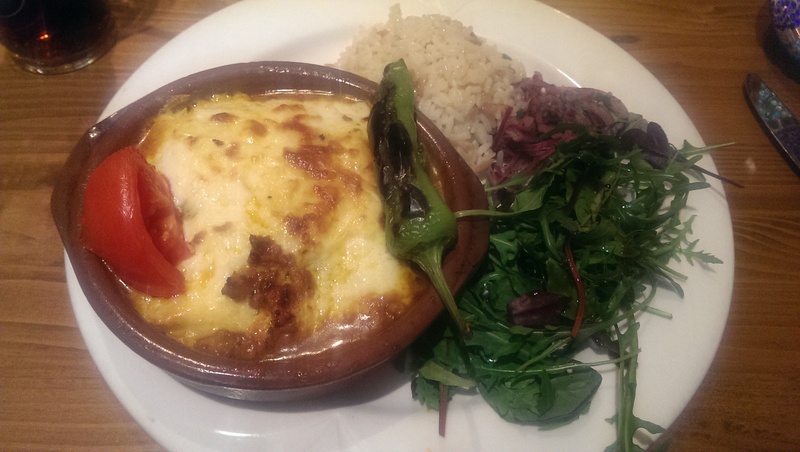 The top was nicely browned and I even quite liked the little bit of pointless salad (mostly rocket, dressed with something that seemed to be a mixture of balsamic vinegar and sugar; sweet yet astringent) but the moussaka itself? It was fine. Hot as the sun and sloppy as a Jackson Pollock but taste-wise it was vegetables in a tomato sauce with a bit of minced lamb in. Here’s the most damning thing of all: unlike the hummus, I think a supermarket moussaka would have been better. It also came with rice, for reasons which I can only assume somebody understands. It would be unkind not to mention the service, because it was efficient, smiley and friendly; we were there early on a Friday night – before the belly dancing started – but I got the impression that they wouldn’t have been fazed by a much busier restaurant. And it could be that, or the atmosphere (or the belly dancing) that attracts people, because the restaurant had a reasonable amount of tables occupied already. But good service can’t redeem average food, and sadly that was all I had during my visit. I couldn’t help thinking that there were better places to have all these things: the mixed grill at La Courbe wipes the floor with Mangal’s version, and if all you want is lamb kofte you may as well head to Kings Grill and spend the change on a pint afterwards. Dinner for two – two starters, two mains and a couple of soft drinks – was almost exactly forty pounds. I feel sad that I can’t say more good things about Mangal. It’s independent, it has great service, it’s already made enough of a go of its business to move into a better location, and it’s doing something no other restaurant in town offers. But if I recommended it on that basis, I’d be making the same mistake as people who are glad Reading got an ice rink, or a Glühwein bar, or a row of shacks selling hog roast underneath Queen Victoria’s unamused silhouette. Because it’s not enough, and we shouldn’t pretend that it is: whatever you do, however simple your food, whether it’s independent or not, irrespective of whether you have competition, ought to be amazing. Otherwise we’re effectively patting people on the head for having a go and saying that’s all Reading should expect, and I just don’t believe that. It’s all very well to say that the best is the enemy of the good, but I reckon – when it comes to Reading, at least – that the average is a much more dangerous adversary. Reading’s branch of Jamie’s Italian closed on July 2018, I’ve left this review up for posterity. January, so far, has been the Month of Eating Differently here at Edible Reading. It started with me revisiting the A4074 and discovering that not all “Pack” based pubs are the same (thank goodness). Then I went even further out of town to eat top notch sushi in Windsor. For the third review of the year it seems only right that I come back to Reading and, even more, that I tuck into food at one of our ubiquitous chains – just to prove that it isn’t only about the independent out of town places. I picked Jamie’s because it feels like a restaurant that cares about ingredients more than your average chain; there’s always been a fair amount of focus on fresh seasonal ingredients and interesting flavours at Jamie’s, and as chains go it’s not huge compared to some of its Oracle neighbours (only 37 branches according to their website, compared to 90 Bella Italias and a whopping 430 Pizza Expresses, for example). On top of that I made a promise, a resolution if you like, that I would eat one vegetarian main every month and it seemed like Jamie’s would be one of the better options for that – after all, good Italian recipes with all those fresh ingredients barely need meat at all, right? I can’t quite remember what Chili’s, the previous restaurant in this space, looked like. All I really recall is the 6 foot plastic chilli suspended from the ceiling, covered in a thick layer of dust. Jamie’s, in comparison, is clean, smart and very contemporary: the middle of the restaurant is all concrete floors and tin chairs but round the edge of the room it’s much more inviting, with red leather banquettes looking out across the other diners. A bit like being on Dragon’s Den but without Evan Davis’ irritating recaps (why does he sum things up mere seconds after they’ve happened? So annoying! But I digress). It’s still a dry – and increasingly long – January for me so I tucked into an elderflower and pomegranate pressé while picking from the menu. That was when it dawned on me that I was going to have to go through with the vegetarian thing and that some of you, for any of a variety of reasons, have to look at a menu and mentally cross things out every time you go out to eat (for that I can honestly say that I salute you). To start I had the baked chestnut mushrooms on crispy music bread with smoked mozzarella, thyme and Parmesan, and in an attempt to stick to the vegetarian side of the menu I swapped out the Parmesan for another hard cheese not made with rennet (although I didn’t check whether the mozzarella was suitable for vegetarians so this might have been a waste of time). It was a surprisingly hard dish to describe – layers of music bread on the bottom with an intricate mosaic of thinly sliced mushrooms on top, dusted with the cheese, the middle section rich with gooey smoked mozzarella. I’d almost sum it up as middle class nachos, except that Jamie’s Italian has already beaten me to it by describing another dish on their menu as “Italian nachos” (crispy fried ravioli, in fact). 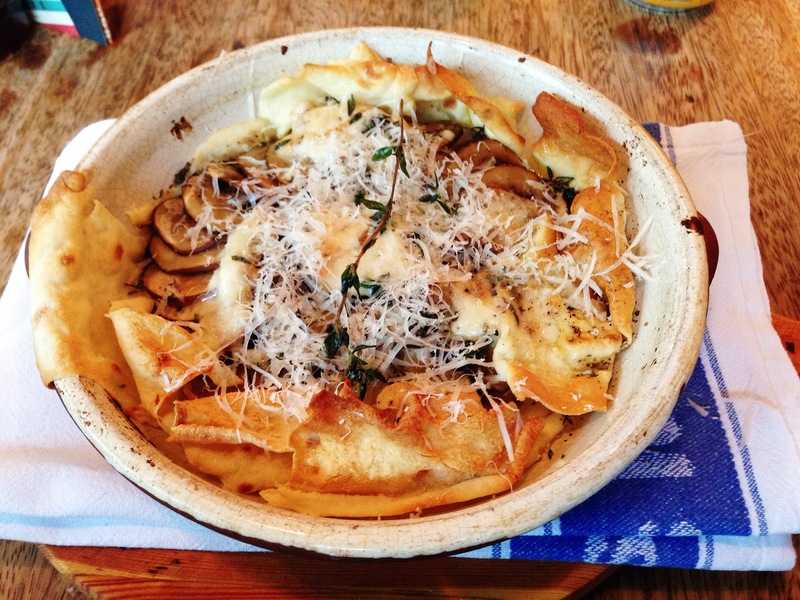 But that’s what it resembled most – crispy music bread at the sides and the central section soggy with juices from the mushrooms and softened by the melted cheese. Did I like it? I’m still not sure even now. It was like a book you admire without enjoying it: more interesting than it was tasty. It was probably a less satisfying way to eat mushrooms than the myriad of other options on the menu – stuffed into arancini, heaped on bruschetta, tumbled into fettucine – options which, as I worked my way through this dish, I couldn’t help wishing I’d ordered instead. 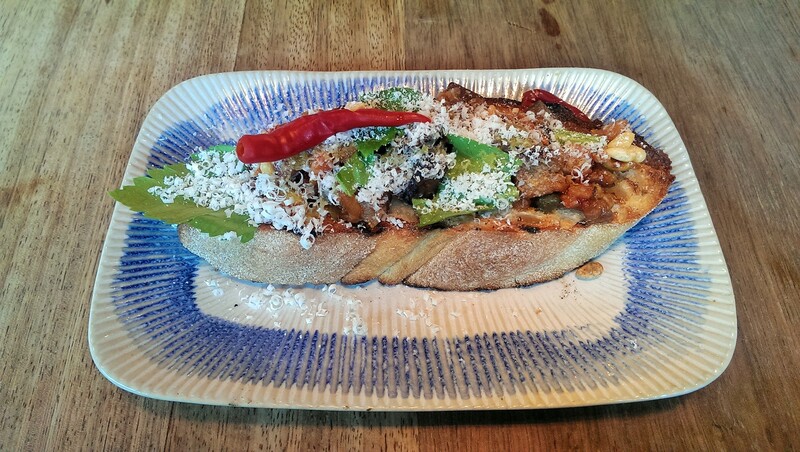 The caponata bruschetta, on the other hand, was as pretty as it was tasty. The caponata itself was lovely – the rich, smoky aubergines were diced and mixed in with tomatoes and pine nuts with a sprinkling of grated ricotta on top. I love the earthy, slightly sweet flavour of caponata and this was a very good one. The bread it came on was less of a success, being tough and difficult to cut (I ended up tearing it with my knife and fork instead). A bit more olive oil or less time under the grill might have been better. Sitting on top of the dish were a couple of small red chillis, barely cooked with their tops chopped off. I genuinely couldn’t fathom what they were doing there – they looked small enough to be properly explosive and I couldn’t see how they fitted in at all. I wondered if it might be some kind of homage to Chili’s – that was the only decent explanation I could come up with. I didn’t eat them. The vegetarian main courses at Jamie’s, according to their website, amount to two – one pasta, and one salad. There are more if you’re prepared to forego the Parmesan, but the menu doesn’t make that clear so you’re relying on the waiter (“we don’t have a vegetarian menu”, he said, “but I can talk you through it”). Pasta in tomato sauce sounded pretty humdrum, and I’d already had mushrooms, so I went for the superfood salad, thinking that anything with the word “super” in the title couldn’t be all bad. 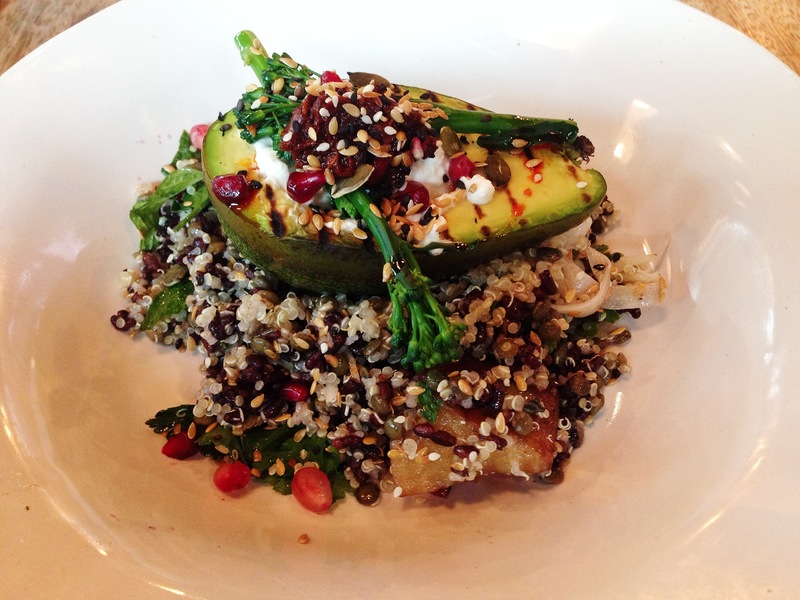 Besides, the menu made it sound like it contained so much stuff: avocado; shaved fennel; candied beetroot; broccoli; cheese; pomegranate; seeds; and a “fennel blossom Sicilian harissa”. It just sounded like a party in a bowl, and I was genuinely interested to see what turned up. What the menu doesn’t tell you is that that description suggests that all the ingredients get equal billing, and they don’t. So I really enjoyed the sweet chunks of candied beets. They were both delicious. I liked the shaved fennel, although it had been very finely shaved indeed and got a little lost. The two smallish spears of broccoli were just dandy. The avocado, served on top, was very nice – flashed under a grill I’d guess, from the lines on top, and ever so slightly warm. Where the stone had been there was a little reservoir with cottage cheese on it, and the smallest blob of harissa, which may have involved fennel blossom in some way but was just generic hot stuff. But really, this was about the rest of it, including many things the menu neglected to mention. So yes, there were lentils and some pumpkin and sesame seeds in there, and the occasional bit of pomegranate, and lots of mint leaves (because Jamie’s loves putting mint in everything). But there was also a lot of quinoa, along with plenty of what looked like stubby grains of wild rice but, having researched it, may have been black barley. All that amounted to a big stodgy pile of heavy going, with nowhere near enough flavour to elevate it from chore to treat. When I told a vegetarian friend about this dish, she said “personally, if they’d said there was quinoa in it I’d never have ordered it”, which pretty much hits the nail on the head. Really, it was like the contents of one of those square plastic tubs you buy for lunch from M&S in an attempt to pretend to be a better person than you really are; if this was a party in a bowl, it was the kind where you started looking at your watch half an hour in because all the fun people had already left. 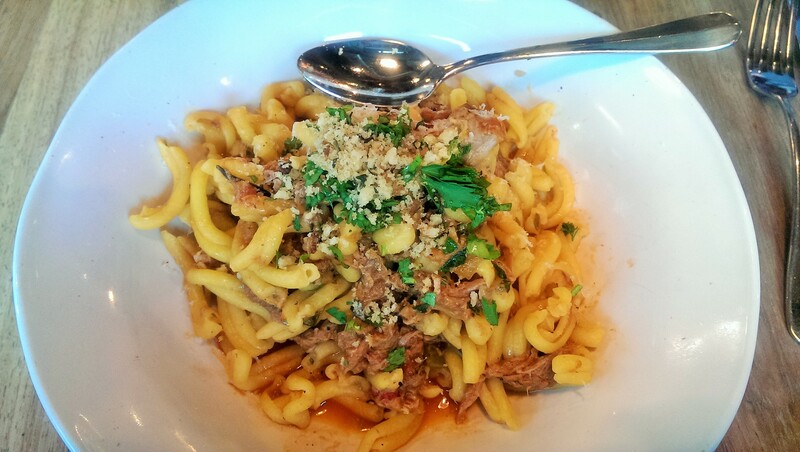 The other main was one of the specials – an “amazing ragu of pork with tomatoes, chilli, garlic and loads of herbs tossed through home made casarecce pasta” (I’m quoting from the blackboard here, so the trumpet blowing is Jamie’s and not mine). I was expecting a bowl of pasta with a thick sauce of tomato and pork in roughly equal measure, but what in fact arrived was a bowl of pasta with a lot of shredded pork in it (and I mean a lot: the meat was generous to a fault). All the other ingredients were present as described, but apart from being slightly watery there was no discernible sauce. This was just a meat and carbs dish: none of your five-a-day here. On top of the heap of pork was a spoonful of herby, lemony breadcrumbs which really did lift the dish but it was just one spoonful, and a little more would have given the dish a lot more oomph. As it was, you couldn’t fault it for quantity but overall I’m afraid it bored me and I couldn’t finish it. Nor could I face dessert afterwards, even if their chocolate brownie is, according to the menu at least, “epic” (I can hear the strains of that trumpet again). Service was decent. The chap serving us was friendly enough and happy to pick out the vegetarian options but had the disconcerting habit of saying thank you after every single item we ordered, something which started to feel robotic very quickly. I wasn’t feeling a lot of love. I also wasn’t feeling the warmth, as there seemed to be a draught coming from the back of the room, whipping round our ankles. When we asked early on if there was a door open in the kitchen we were told that this was just the colder part of the room and that the other tables they had available wouldn’t be much better. On a freezing winter’s day in January I thought this was a very poor show, especially as it got even chillier by the time our mains came (another homage to Chili’s, perhaps?). The total bill for two courses and a soft drink each for two was forty pounds. That felt like reasonable value for the food, even if the experience wasn’t anything to write home about. After the last two reviews, writing this feels like a bit of a comedown. I know I don’t need to eat out of town to get good food but when the better chains, which to me includes Jamie’s, let me down it can seem like the Oracle doesn’t have a lot to offer (appropriately the best of the Oracle’s restaurants, Cote and Tampopo, are right at the edge: it’s almost as if they’re trying to break away and escape). I feel especially sad for the vegetarians out there, because I think they should be entitled to expect better from a restaurant like this – so for vegetarians looking at a menu this size and seeing such a short list of suitable options I can only say sorry. I haven’t found an amazing place with loads of attractive meat-free choices that you’ll be rushing to visit. Not yet. But it’s only January. At the start of the year, AltReading asked me to contribute to a piece about what people wanted to see in Reading in 2015. So I talked about some of the big gaps in Reading’s restaurant landscape – that we need a tapas restaurant, a pizzeria, a town centre pub doing simple, tasty, well-executed food and so on. It wasn’t until later that I realised that my list of gaps itself contained a gap: Reading doesn’t have a good Japanese restaurant. There’s Sushimania, which can be okay (when it’s not too busy – and woe betide you if it is, because a person can get very drunk on their house white waiting for the food to turn up. Take my word for it) and there’s Yo! Sushi. That’s it. That partly explains why this week’s review is of a restaurant in far-flung Windsor, the furthest from Reading to date. The thing is, I suspect the reason I didn’t put a Japanese restaurant in my original wish list is that, for years, when I’ve wanted Japanese food I’ve got on the train and gone to Misugo instead. It’s a modest little place just opposite Windsor’s Firestation Arts Centre, about a ten minute walk from the station (a walk which takes you right past a very good fishmonger, a few doors down from the restaurant – something which might explain a lot). It’s nothing to look at from the outside, and pretty understated on the inside. Every time I’ve been (and I’ve only ever been at lunchtimes) it’s virtually empty: it’s rare to see more than one other occupied table. It also happens to do fantastic sushi. Arriving on a Saturday lunchtime without a reservation, I was delighted to see that they had a booking for a big table, even if it meant that I didn’t get my usual seat next to the window. It’s a long thin room split across two levels and it really is very basic – plain wooden tables, plain wooden stools and simple, elegant (if atmospheric) lighting. But that simplicity feels like a bit of a hallmark which carries across into everything else – unobtrusive service and simple, brilliant food. The menu is one of those big, tempting ones that requires several attempts in a single sitting (I envied the big table which turned up a little after I arrived – eleven fellow diners would give you the opportunity to try a lot of the options), divided into sashimi, sushi, small hot dishes, rice dishes and noodle dishes. They also do a small, if tempting, array of bento boxes if you want someone to make your tricky decisions for you: I didn’t, but the woman at the table behind me had one and it looked nearly enviable. First to arrive was the sashimi, which was beyond reproach. 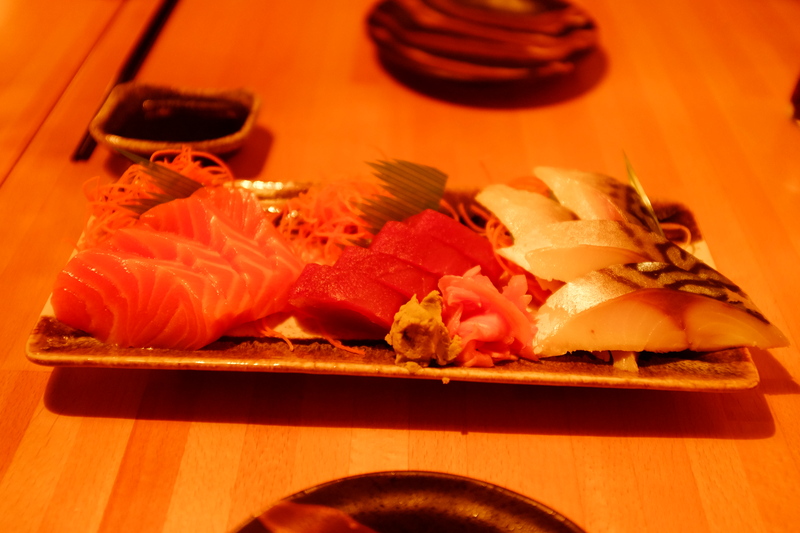 If you’re used to Yo with its little dishes, a few small slices of salmon trundling round under a plastic dome on the belt, the sashimi at Misugo – in terms of the presentation, the range and the sheer quality – is like going from a standard picture to HD. So the salmon here came as four beautiful thick slices, beautifully marbled, fresh and clean, as soft as mousse. I’m no expert on sashimi, but I don’t think that marbling and that texture happens by accident or luck. The tuna was firm, meaty and distinctly unfishy (as odd as that sounds). If sashimi has never appealed to you then tuna from Misugo is the perfect gateway fish. Finally, the biggest revelation: four sections of mackerel, complete with shimmering skin. I always order the mackerel and it always blows me away, somehow strong and subtle all at once in a way few dishes (and few people, come to think of it) ever manage. We gently transported them onto our tiger-striped plates with chopsticks, dabbed them in soy, added ginger and popped them in our mouths, and then we were transported ourselves. Sushi was every bit as good. Avocado maki were plump things, tightly rolled, each with a big fat core of ripe buttery avocado. But there was more going on: a hint of what tasted a bit like lime, tucked between the rice and the delicious green flesh. Again, this was a world away from anything you might pluck from a conveyor belt. 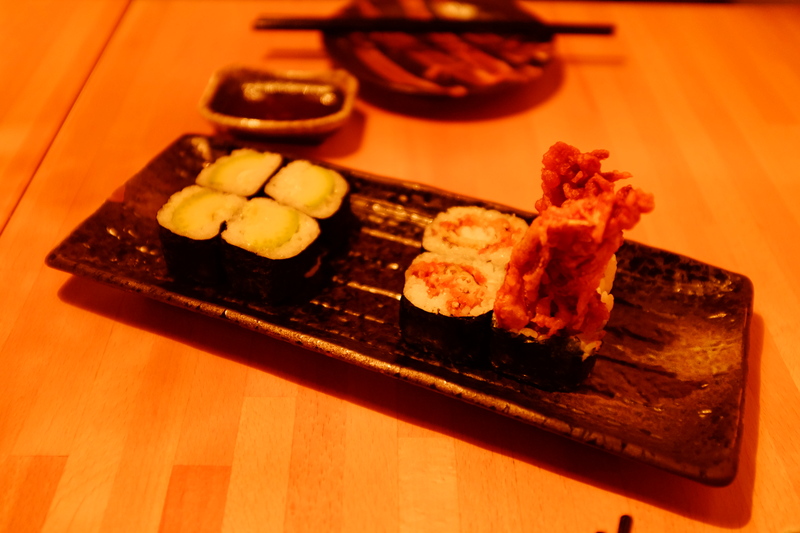 Soft shell crab maki – the crab still warm as it reached our table – were gorgeous to look at, the crab almost looking as if it was making a break for it. All of a sudden I didn’t envy that table of twelve half so much, because it was difficult enough sharing these between two. The waitress asked if we wanted another look at the menu and saying no felt like the worst kind of folly, so we rounded up more options and ordered again. Vegetable gyoza were gorgeous – lighter than they looked, like crispy islands floating on the smallest, subtlest pool of vinegary dressing. More maki – this time grilled tuna with mango – were also delicious, the tuna soft and the mango fresh and firm rather than soft and ripe as the avocado had been. A little drizzle of sauce over them added a deep, fruity note. Last of all, the only misfire of the whole meal. Chicken yakitori looked the part – thigh meat threaded like a sine wave onto skewers, grilled, brushed with sticky sauce and scattered with sesame seeds. But they needed to be more: more well cooked – the slightly charred bits were a delight, the rest a bit of a chore – and with more of the gloriously smoky sauce. They were the only thing we didn’t finish, although by that stage we were too full to ask for dessert anyway. Anywhere else, it would have been a good dish, but Misugo had set the bar too high by then. I was sad that they played their worst song as the encore, but I’d loved the concert too much to hold it against them. Being on the wagon in a Japanese restaurant, it turns out, is less of a hardship than you might think. I was tempted to try Calpico, a Japanese yoghurt drink (and if I’d known it tasted just like Yakult, which apparently it does, I definitely would have) but in the end I opted for something which was described as an “aloe vera soft drink” and tasted a bit like orange squash on a gap year. I liked it enough to order a second, at which point the waitress told me with a smile that you could buy it in Sainsburys, even going so far as to check which my local branch was. Service was perfectly judged – polite, distant when you wanted to be left in peace but there when you needed it. 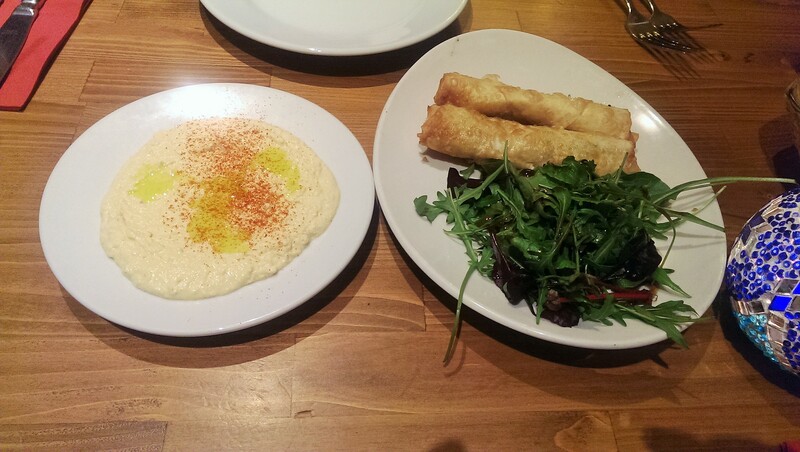 Nobody at Misugo is ever going to make your teeth itch with excessive – or indeed any – mateyness, and they probably won’t ask whether you enjoyed your food either (most likely because they’re rightly confident that you will). But it was restrained and tasteful, just like everything else. Lunch for two – a total of three soft drinks and eight small dishes – came to £47 not including tip, which I thought was excellent. Even as I left I was wondering why I’d left it so long and when I could go back, and envying anyone for whom this restaurant was their neighbourhood restaurant. Actually, that last bit might not be entirely true. It’s very tempting, when you eat somewhere great that isn’t in your home town, to say “I wish I could pick this up and move it to Reading”, but on reflection I’m happy to keep Misugo exactly where it is. I like Windsor. I like feeling excited about going there when I get on the train (even knowing that I have to change at Slough doesn’t put me off). I like strolling down Peascod Street, past the boutique called “Cognito” (that always tickles me: as an anonymous reviewer I feel I ought to go in at some point), seeing the fishmonger on St Leonards Road and knowing I’m nearly there. And, perhaps most of all, I like the fact that it’s close enough to get to, but just far enough away that I’ll never tire of it: a balance almost as fine as their food. Ah, the New Year. What a magical time it is! We know what day of the week it is again, chocolate ceases to be a food group and everybody has to go back to work. It’s ages until the council come to empty your bins and the glass recycling looks positively terrifying (it was the guests! The guests drank it all). What better way for me to commemorate this bleak state of affairs than to revisit the scene of 2014’s biggest culinary disappointment? Well, almost. Amid all those awards at the end of last year I deliberately kept schtum on all the candidates for the wooden spoon, but the numbers don’t lie: my worst meal of 2014 was at the Pack Horse in Mapledurham, an outwardly pretty pub dressing up desperately ordinary food with faffy presentation and making me – and I can’t quite believe I’m typing this – nostalgic for the days when it used to be a Blubecker’s. After reviewing it, many people told me I had gone to the wrong Mapledurham pub: the Pack Saddle – similarly named but slightly closer to town – was the one to visit, they said. I wanted to believe them, but I still got nasty flashbacks as my car pootled down the A4074. Was it rising bile, or the memory of that wobbly shoulder of lamb? Maybe the reason I didn’t go to the Pack Saddle last year is that I couldn’t find the car park. It was oddly difficult, involving an almost handbrake turn when we nearly missed the massive sign for the entrance (maybe it’s for the best that I’m having a dry January). Getting inside though, the pub was warm and welcoming despite not being all that packed: there was a heavenly smell of wood smoke and a handful of people were sat up in the beautiful panelled bar room. The dining room was down a couple of steps and I can imagine it would feel lovely and buzzy had it been occupied; sadly, the other two tables left shortly after we sat down so we sat alone in the dining room with just a portrait of Her Majesty Queen Elizabeth II, from shortly after the Coronation, gazing down on us. She looked a little disappointed. Perhaps I should have worn my tiara. I really liked the look of the menu for two reasons. First, it was the right size: long enough that you felt there was plenty of choice but short enough that you could reasonably expect everything to be done well. But secondly, everything was just a little more interesting than it needed to be. Everywhere on the menu there were little flashes that suggested the kitchen knew what it was doing; chicken terrine came with pickled vegetables and Parmesan crispbread, beetroot was paired with goat’s cheese panna cotta, not plain old goat’s cheese. The fish main course was accompanied by a crab cake. The smallest hints of skill – nothing boastful, but enough that you could see them if you were paying attention. 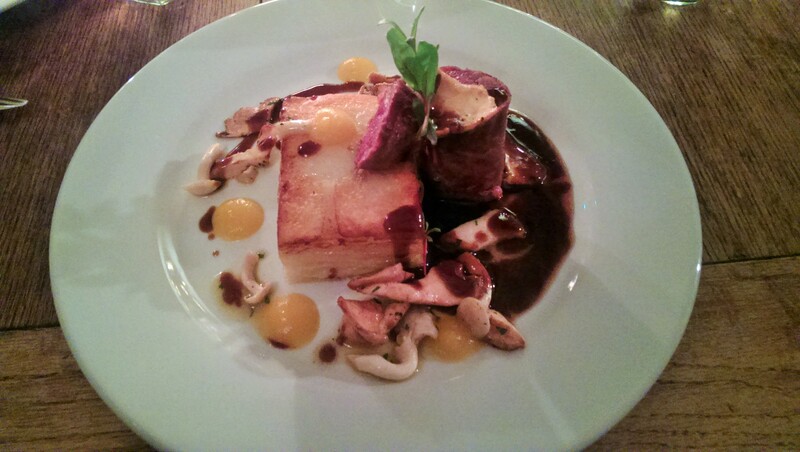 My New Year’s resolution is to order one vegetarian main course every month and I nearly did it at the Pack Saddle. Crispy Parmesan polenta and filo roll stuffed with roasted vegetables sounded delicious and a cut above a lot of the unimaginative mains on menus I’ve seen (and since I made that resolution I’ve looked at a lot), but I was foiled: it was sold out. The alternative was mushroom risotto, but I have a feeling there will be a lot of chances to try that over the months ahead. Won over by some of those flashes of skill on the menu, I did order a vegetarian starter. Balsamic glazed beetroot salad with goat’s cheese panna cotta was very much a sign of what was to come: beautifully presented in a way that at first sight looked haphazard but was in fact very orderly. 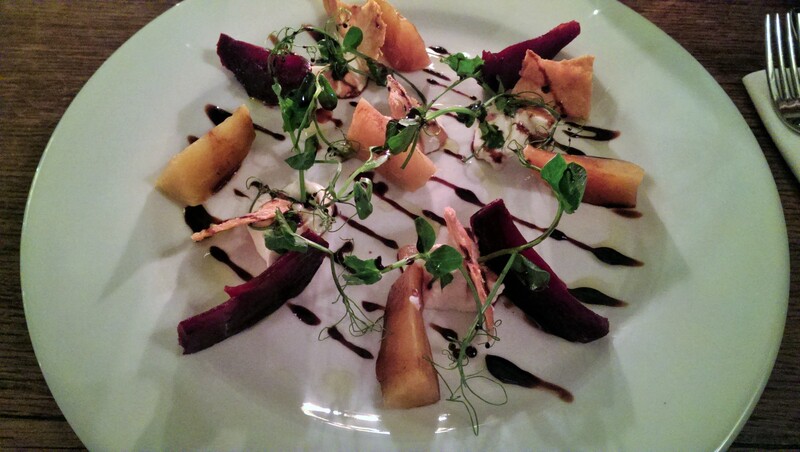 What I got was a generous amount of sweet red and earthy golden beetroot, cut into eighths, interspersed with a few creamy dollops of goat’s cheese panna cotta and drizzled with narrow stripes of balsamic glaze. The panna cotta was salty, creamy and, again, earthy. I was expecting to get much more panna cotta and much less beetroot but the balance was perfect and felt like a much more reasonable portion for a starter. A few shards of parmesan crispbread were dotted about the plate which added some welcome crunch. It felt like so much more than the clichéd pairing of goat’s cheese and beetroot – lots of different things to combine, contrast and enjoy. 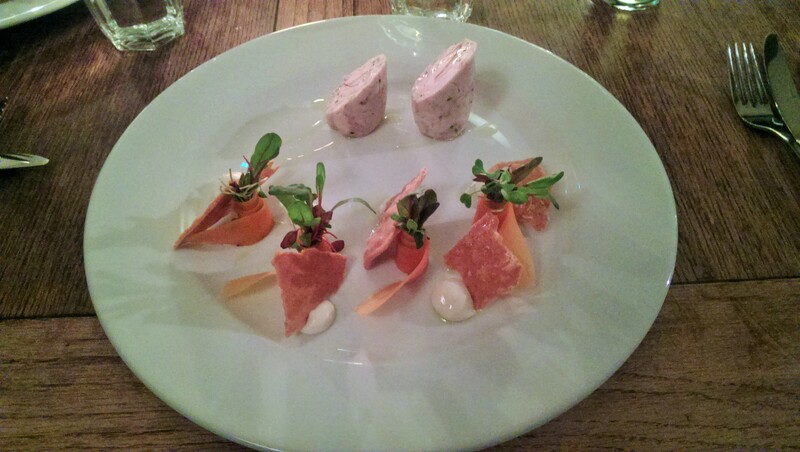 The chicken terrine was if anything even more pretty and precise: a bit of a theme at the Pack Saddle where the plating has a rather OCD air about it. A cylinder of chicken terrine had been sliced diagonally into two sections and stood on its end (perpendicularity, it turned out, was another quirk of the presentation). With it came little blobs of celeriac purée, more of that Parmesan crispbread and little spirals of pickled carrot, wrapped round a sprig of herb and leaves. This dish was a good illustration of why restaurant blogs can’t rely on photographs alone: from the picture it looks lifeless and prim, but in practice it was bloody delicious. The chicken terrine, beautifully compressed, tender, delicate meat was clean and fresh with a slight note of smoke from the bigger pieces of smoked chicken running through the middle. The pickled carrot, with a hint of lime, had wonderful crunch and the celeriac puree added just enough sweetness. Only the Parmesan crispbread fell a little flat – something lighter like music bread might have done the same job better – but it was a starter I wanted to begin again the moment I finished it. Of course if I’d done that I might have been too full for the main courses and – as it turned out – that would have been a shame. 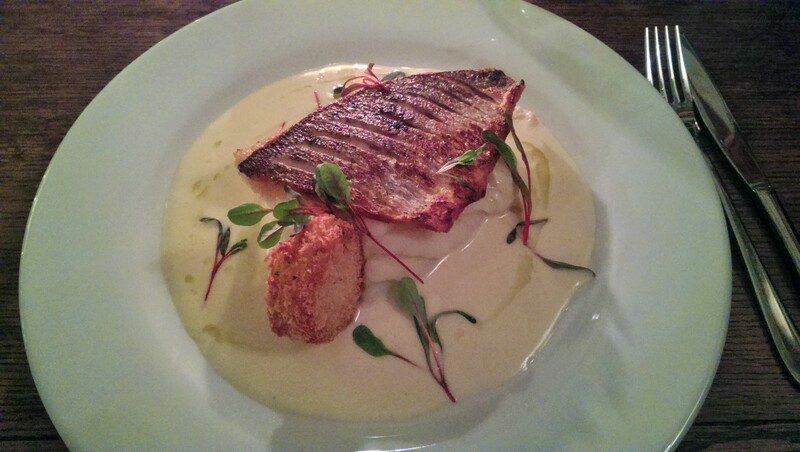 Fillet of sea bream was very good with the perfect balance of soft yielding flesh and super crispy salted skin. It was served, as is traditional these days, on bed of mash but, less traditionally, this was surrounded by a moat of horseradish veloute. I’m not sure I’ve had this combination before but I liked it a lot – the horseradish was mild and mustardy rather than full on hot and the mash was indecently creamy and generous to a fault. Nestled into the side of the mash, like a vertical limpet, was a mini crabcake (that perpendicularity again). This was less successful for me – it was a little plain and lacking the crispy texture promised by those breadcrumbs – but I admired the ambition, even if I wasn’t completely on board with the execution. All in all, the dish was lovely: although with all those potatoes and cream it wasn’t quite the slimline option offered by most fish courses. It also felt, at a smidge under thirteen pounds, like impressive value. The other main course, saddle of venison, was wrapped in serrano ham and served – can you guess? – standing on its end. This was the case where the presentation seemed most surreal because it was leaning against a big block of boulangère potatoes as if it was a supporting feature rather than the headline attraction. The rest of the plating, again, was rather OCD with little circles of butternut squash puree alternating with wild mushrooms at worryingly precise intervals (a puddle of jus was confined to the right hand side of the plate). But anyway, that’s a pointless quibble because it was delicious and everything worked, separately and together, from the sweet puree to the pink, tender venison to the slab of potato, salty and softened with stock. The wild mushrooms were particularly welcome (I partly ordered this because so often, the mushrooms aren’t wild but the exaggerations on the menu are). Normally at this point I tell you, in scant detail because it’s not really my area, about the wine. Because I’m on the wagon this month I will instead give you the far less thrilling news that the Pack Saddle offers a decent range of soft drinks including Belvoir and Appletiser, plus the overpriced orange squash that is J2O (just me?). The wine list – with its constant reproach of “look what you could have won” – looked interesting, with lots of new world wines, Chapel Down (an excellent English sparkling) and plenty of decent bottles for under twenty quid. I could see things which would have gone perfectly with the bream, and the venison, but then I started to feel a bit sad so I put the list down and enjoyed my elderflower pressé instead, with no gritted teeth whatsoever. The dessert menu here is fairly traditional but after two interesting and clever courses it felt like the desserts would be more sophisticated than advertised. After all, that seemed to be what they do here: promise low and deliver high. I was tempted by the cheeseboard (the holy trinity of local cheeses – Barkham Blue, Spenwood and Waterloo – all world-beaters, all made in Berkshire) but I wanted to see what they’d do with the more obvious choices, so we went for chocolate brownie and carrot cake. 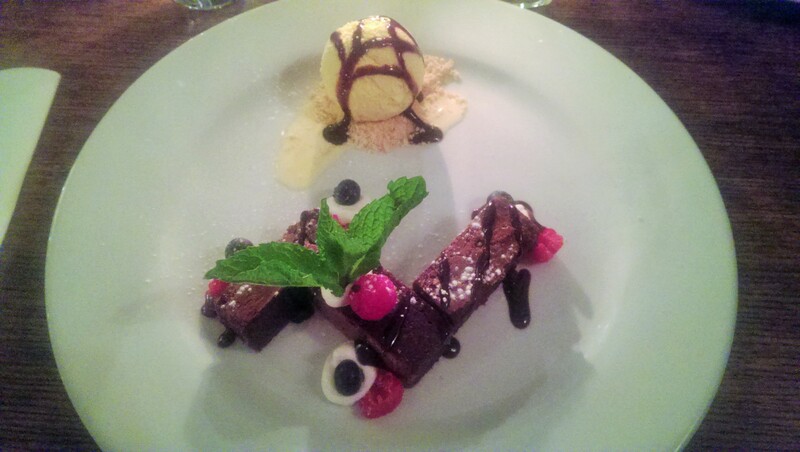 In most pubs, having chocolate brownie for dessert means getting a microwaved slice of Brakes’ brownie, a squiggle of chocolate sauce and a scoop of bland vanilla ice cream. In truth this wasn’t a million miles away from the brownie here, the one let down of the dishes. The brownie itself was sticky and rich (and home made) and had been cut into three slices and arranged in a zig zag. There was chocolate sauce and vanilla ice cream although this time the ice cream was sat in a puddle of crumbs and the brownie had some dollops of cream with blueberries and raspberries nestling in them. Don’t get me wrong: it was tasty enough, and I ate every last scrap. But it didn’t match up to the earlier courses for creativity and excitement. The carrot cake was better, although the plating repeated the motif of little orange circles set out with frightening regularity. This time it was sweet carrot pureé, although I’d have been hard pressed to tell it from the earlier butternut squash purée in a lineup. The vanilla ice cream was pretty anonymous and the icing didn’t stand out, but what saved the dish was the cake itself – moist but not too moist, nicely spiced and with a slightly nutty texture to it. 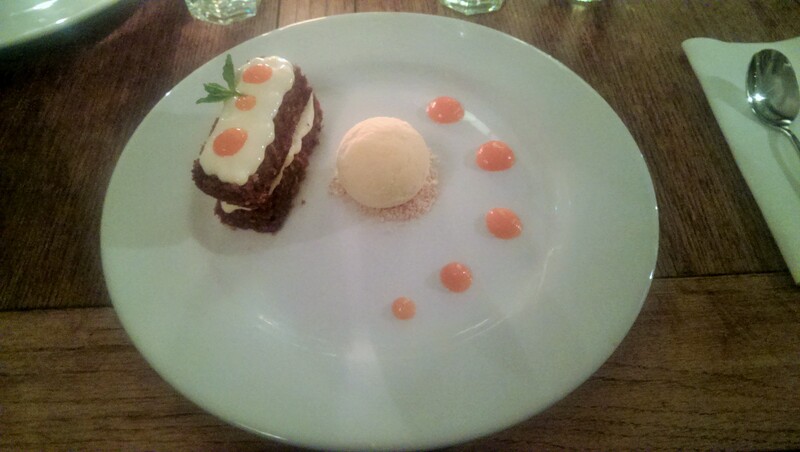 A perfectly nice carrot cake, but I was expecting more after the promise of the first two courses (my family make a better one, put it that way). Service throughout was excellent – something I particularly appreciate on a day like the first Saturday in January, when surely nobody really wants to be at work. The two staff that looked after us were both unerringly friendly and helpful – and also seemed to be genuinely delighted when they got positive feedback on the food. With the bar being busy and the restaurant being almost empty I worried that we’d either get pestered or ignored, but they did a brilliant job of making us feel looked after without being hovered over. The bill, for three courses and two rounds of soft drinks, was a touch under sixty-three pounds excluding service. All of the courses felt like excellent value: the venison, for example, was under sixteen pounds and easily as good as far more expensive venison dishes I’ve had in restaurants with higher opinions of themselves. So, here’s to 2015. I’m sure it will be a lot like 2014 in lots of respects – good meals, bad meals, pleasant surprises, even wobbly shoulders of lamb – but at least there will be one important difference: driving down the A4074 won’t bring me out in hives any more. I think I might make another trip that way soon, just to be certain.